Any coffee enthusiast would love to indulge in the best tasting cup of coffee. To get this kind of beverage, you must use a coffee grinder that ultimately produces the finest coffee. Gourmia GCG195 grinder delivers these results beyond your expectations. The machine is made with a passion which clearly portrays the expertise of its manufacturers. The appliance is highly innovative and gives you the value for your purchase every time you use it. It is small in size but will make your moments in the kitchen fun and easy. 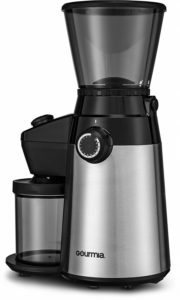 The conical burr of this grinder is robust enough to allow you grind the finest coffee possible. You can use it to produce Turkish ultra fine powder to any coarse grinds for other brews. Gourmia GCG195 can be used either at home or in the office. This versatility is enhanced by its weight and dimensions together with its sleek and compact stainless steel nature. The grinder is fully certified by ETL giving you the assurance that you are buying a high quality, safe and efficient appliance. 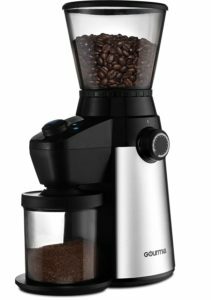 Gourmia GCG195 coffee grinder has easily removable parts which make it easy to clean and operate. It also comes with a detailed user guide which allows even a novice to use it without a struggle. The grinder operates quietly, yet produces a consistent grind every time you use it. It also has 15 settings which allow you to make different types of coffee you want. Unpack the grinder and remove all packing materials. Wipe the pieces of any dust that might have accumulated. Wash all removable parts of the grinder with warm soapy water and soft piece of cloth. These include; bean hopper and its lid and ground coffee container and its lid. Take off the bean hopper by pressing down the release button while simultaneously turning it counter-clockwise. Always clean the appliance with water after use and then dry it thoroughly. You should, however, never immerse it in water. Place the grinder on a flat surface and make sure the mill head is in position with the bean hopper holder. To place it correctly, hold the grinder head and align it with the grinding wheel. Rotate the latter in a clockwise position until it locks in place. Attach the bean hopper to its holder by aligning the tab on the bottom to the groove of the holder. Then turn the bean hopper in a clockwise manner until it holds in position. Put the appropriate amount of coffee beans, but do not exceed 350 grams. 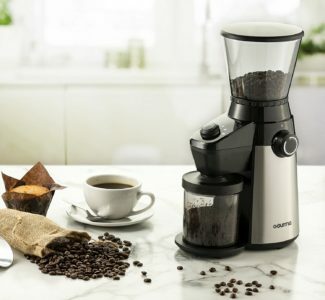 Turning on the coffee grinder when there is no coffee bean in the holder will lead to the appliance stopping after five minutes. After you are done with one round grinding, you should give the machine at least 30 minutes break before grinding another batch. Use the grinder control dial to select the preferred coffee texture, between 1-15, with 1 producing the finest and 15 the coarsest texture. Set the grinding timer dial depending on the amount of coffee you want. Failure to adjust grinding time will set the grinder to grind at the default time. Connect the coffee grinder to the power source, and this will lead to the set time indicator lighting at 100% brightness. The other indicators will be lighting at less than 50%. In case you do not press any button during the first 90 seconds of plugging in the appliance to the power, it will automatically go into hibernation mode. The coffee grinder stops automatically when the set time is achieved. In this case, remove the ground coffee container from its holder, then remove its lead and pour out your coffee. Unplug the coffee grinder from the power source. Unplugging the appliance from the wall socket is the first thing you should do immediately you are done grinding. Before cleaning the machine, you need to unplug it and let it cool down completely. Also, avoid immersing the power plug in water or letting it contact with fluids to prevent electric shock. Disassemble the appliance and clean each part separately with warm soapy water and then dry them thoroughly. The grinding blades are a little complicated and can, therefore, not be washed with plain soapy water and a cloth. You will need to use a cleaning brush and then rinse it well with clean water. Before replacing it back, make sure you have dried it completely. To avoid injuries, handle the blades with lots of caution as they are very sharp. Wipe the body dry and store the coffee grinder in a dry are when it is not in use. The blender’s small size allows it to fit in your kitchen cabinet perfectly. The coffee grinder can only be used to grind properly dry and brittle food stuff. Do not try grinding wet or gummy substances such as chocolate, whole ginger of sesame seeds. Spices such as cinnamon, nutmegs, dried corn, rice, barley wheat, ice cubes and cloves are also not to be ground using the coffee grinder. Grinding these stuff will only damage your coffee grinding machine. You might, however, use to grind peppercorns but as you know, freshly ground peppercorn has a strong scent and taste which may affect your coffee. To avoid such a case, purchase a different grinder for that purpose. To get the freshest and most flavorful coffee, make sure you only ground enough coffee to make at the moment. Also, store your coffee beans in an airtight container and place them in the freezer. This will maintain their freshness for two months. Make sure you clean the grinder every time after use as coffee left in the appliance becomes stale and might affect the purity of your freshly ground coffee. I have Gourmia GCG195 electric coffee grinder and must say this is excellent grinder! Easy use, fast, not overpriced and one of the most important and to me the most important feature is that it is not too loud. How to make a Coffee Frappuccino Drinks at Home?